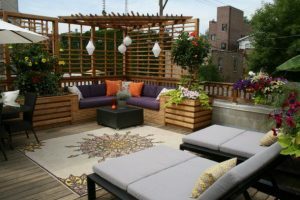 There is nothing like a cozy outdoor space where you can soak up the sun during summer. All you will need to set this up are two things: outdoor seating and a patio cushion set. The seating will be individual to the space. You can go with actual outdoor furniture, or you can do a DIY set of benches. Once the seating is in place, it is time to make the cushions. The most important step that will save you a lot of hassle down the line is getting the measurements right. The measurements should include the height of the cushion. Once you have all the measurements, you can start making the covers. For the fabric, add an inch to your measurements to allow for a half inch seam. The same goes for the panel of fabric that goes all the way around. Even the height of the long panel will need an inch added to get the same seam allowance. Cut the fabric and sew all the panels together. Leave one side of a single panel open to sew in the zipper. If you don’t have a sewing machine, then use the measurements and order it online. Next, use the initial measurements and order the cushion filling. The Foam Factory will ship cushion filling cut to your exact measurements. The custom foam will come with batting for comfort, and you do not need to account for that in your measurements. Now that you have everything in place, carefully place the cushion filling inside the covers. Your outdoor space is ready. Previous PostShould you invest in a Memory foam mattress?